During my office years, Wednesday afternoons were marked by an enthusiastic lady storming through the open plan office inviting people for a 15-minute workout in the coffee corner. I used to laugh and silently mock her, "ain't nobody got time for that, we're busy and important people!" Until I burned out. During the last weeks at the office I would eagerly wait for this cheery lady to arrive and to give me some sweet distraction and movement into my day. Work can be stressful. There is always more to do than there is time, and eventually this can really get to you. For a while, it might work for you as it gets your adrenaline going and you can deliver tight deadlines. But take it from me, you'll be much more productive in the long term if you can remain calm and stress-free throughout your days. 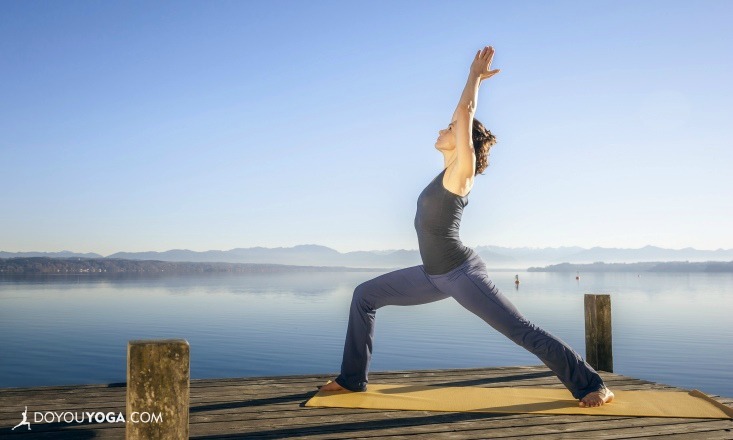 If you are feeling stressed, try these short, 5-minute yoga practices to relieve work stress. Meditation can bring some peace and quiet into your day, no matter where you are. You can sit at your desk, or in public transportation, draw your senses inwards, and calm yourself down. When we meditate and draw our attention inside, we are promoting the parasympathetic nervous system. This is responsible for the "rest and digest"-response (instead of fight or flight response of the sympathetic nervous system), and even short amounts of time can have a physical effect of calming down the heart rate, calming down the mind, and allowing the body to be at ease. Start by sitting straight up, relaxing the arms on your lap, and closing the eyes. Start to lengthen the inhale, and lengthen the exhale. Breathe 10 rounds slowly, just focusing on the movement of the breath, the movement in the body. With every exhale, try to let go of tension in the mind or the body, as if you were literally exhaling it out of your system. Then start to relax each body part at a time. Start from the toes, moving through up all the way to the hips. Relaxing the stomach, chest, the back, and imagining the relaxation moving up from the fingertips all the way to the shoulders. Relax all of the muscles in the face and relax the jaw. Sit here in the relaxed state for 1-2 minutes, breathing deeply and slowly. When you feel ready, slowly open the eyes and take a notice of how you feel. Getting up from your chair is important, since sitting all day long does nothing beneficial to the body. The hamstrings and hip flexors are getting tighter from sitting, and the back muscles and shoulders tend to cramp up. Try this sequence a few times a day to get loose again. Stand either behind your chair, or find some other space for yourself where you can have a bit of space. 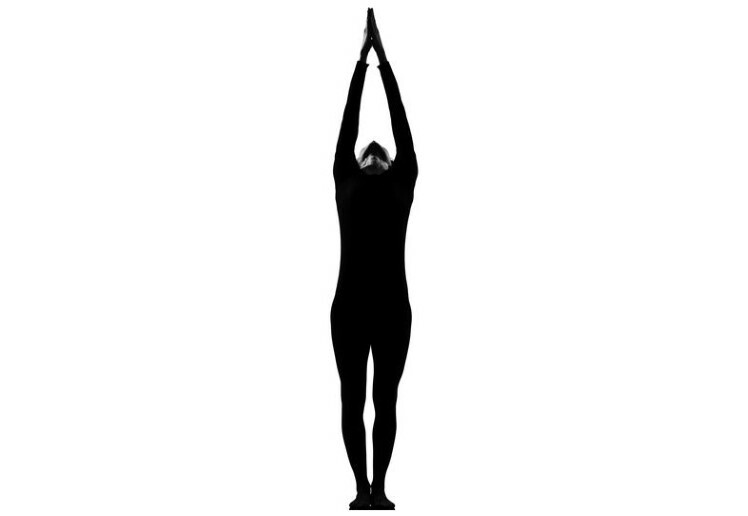 With an inhale, lift up your arms from the front all the way up, palms facing forward, arms reaching to the ceiling. With an exhale bring the arms down from the side of the body, palms facing down. Repeat slowly 10 times, stretching the back, shoulders, and opening up the chest. As you bring your arms up, imagine reaching for the clouds, and as you bring the arms down, imagine parting the clouds. Whatever hangs heavy above your head, whatever clouds your vision, imagine parting the clouds until you see the blue sky again. The Forward Fold will stretch the back, relax the shoulders, and bring some needed fresh blood into the brain. You can keep your knees bent so that your back can remain round. Have your hands on the floor, or take a hold of your elbows and let your head hang. Stay for 10 long and steady breaths. Imagine all of the unnecessary thoughts and worries dripping from your head onto the floor, and feel you head clearing up. Warrior I Pose not only reminds you that you can deal with things that arise in your life, but it stretches the hip flexors, which tend to get tight when we sit a lot. Take one foot back, and exhale yourself into the pose, keeping palms together or arms shoulder-width apart. Stay for 6 long breaths, and remind yourself how capable you are, how strong you are and how you can handle everything coming your way. Be fierce and grounded at the same time, calm and assertive. And don't forget to change sides. The Nadi Sodhana, or Alternate Nostril Breathing, is a great way to bring more balance into your body and mind by harmonizing the two hemispheres of the brain. To start, sit up straight, and close the right nostril with your right thumb. Slowly inhale through your left nostril, pause, open the right nostril and close the left nostril with your ring finger. Breath out through the right nostril slowly, and pause. Inhale again through the right nostril, close off the right, open the left nostril and breath out. Let the index finger and middle finger rest on the forehead. Repeat this for 3-5 rounds at first, slowly advancing to 7-10 rounds. Like with yoga, it is better to take shorter practices of stress-reduction more often, rather than endure stress until the annual holiday is around the corner. Don't wait until you are close to your breaking point, but take some well-deserved breaks throughout your day. Who knows, maybe you'll start a new trend of wellbeing at your office!